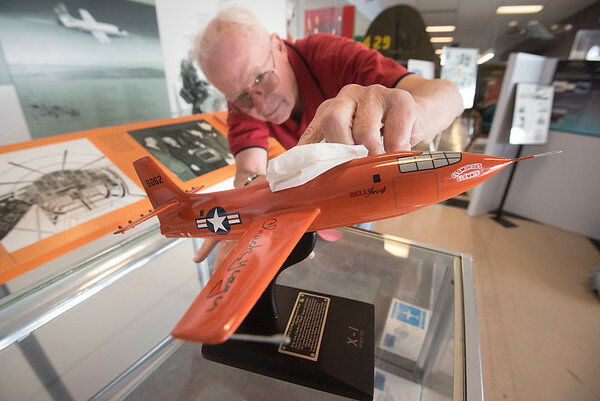 Niagara Falls, NY - Jim Birke, director of restoration at the Niagara Falls Aerospace Museum makes sure the scale model replica of the Bell X-1, part of a larger display, are ready for exhibition along with other displays for the Bell X-1 Breaks the Sound Barrier 70th Anniversary celebration this Saturday. The celebration is free and all are welcome to attend. Bell X-1 Breaks the Sound Barrier 70th Anniversary - Free Event! Museum tours led by our expert docents begin at 9:30 next to Larry Bell’s blue Bell 47 helicopter. Tours repeat at thirty minutes past the hour until the last tour beginning at 3:30. Museum Theater: A fifteen minute talk on the X-1 will be given on the hour from 10:00 through 4:00, followed by a fifteen minute documentary film on preparing the X-1 for flight. Although he does not have a speaking part, the pilot in the film is twenty-four year old Chuck Yeager. The documentary will be followed at half past the hour by a twenty minute series of short films commemorating the 70th birthday of the United States Air Force, which was took place just last month on September 18th. Airplane folding instructions: Kids of all ages can learn to fold our commemorative X-1 paper airplane. (A contest may break out - just sayin'.) Take home a NASA paper airplane to cut out and build at home. Aircraft and Space exhibits are found throughout the museum, from the 1910 Curtiss Pusher that taught the first Navy and Marine pilots to fly to the Lunar Module ascent engine that lifted all twelve astronauts from the surface of the moon. Be sure to see the Niagara Aviation and Space Hall of Fame honoring over two hundred Western New York engineers, technicians, pilots, and managers who played critical roles in the incredible contributions of our region to advancing flight and the exploration of space.